Assemblywoman Addie A.E. Jenne recently visited Norwood-Norfolk Central School to check out improvements to the girls' varsity softball field. The improvements were made with additional state aid secured for the district by Assemblywoman Jenne. Pictured are, front row from left manager Olivia Planka, Taylor Allen, Maisie Voss, Assemblywoman Jenne, Alyssia Simons, Chloe Harvey and Ashley Powell. Middle row: Miranda Smith, Kaelee Shrewsberry, Vanessa Prashaw and Sici Kahrs. Back row: Athletic Director Nate Plantz, Assistant Coach Jess Harvey, Grace Furnace, Kaeonna Deshane, Reanna Taylor, Lexi Allen, Hailey LePage and Coach Becky Byrns. NORWOOD -- North Country Assemblywoman Addie A.E. Jenne, D-Theresa, had the opportunity to throw out the first pitch at the Norwood-Norfolk Central School girls' varsity softball team's final regular season home game. Norwood-Norfolk School Superintendent Jamie Cruikshank showed Jenne the improvements that were made to Norwood-Norfolk’s softball field using $25,000 in supplemental state aid she secured for the district last year. Cruikshank said fencing was extended from the backstop down the foul lines past both dugouts, which will be covered with roofing when the project is completed by this summer. "The baseball field with dugouts was done a couple of capital projects ago, and I have heard some concerns about the inequity of the two fields since I first came here," Mr. Cruikshank said. "I just saw this additional funding secured by Assemblywoman Jenne as a great opportunity to bring our softball field up to snuff so it is also one of the best in the North Country," he noted. "It's difficult to run a project like this through the regular budget process. This supplemental funding from Assemblywoman Jenne was crucial to bringing this project to fruition," the Norwood-Norfolk school superintendent stressed. Cruikshank said the fencing makes the field safer for players and spectators alike. "Now there is separation between the student-athletes and the bats and balls that are flying around during games and practices. It creates a much safer situation," he said. Jenne said she was delighted to see the improvements that had been made to the softball field. "I think that being active in extracurricular activities is very important for the next generation as they prepare to move into the workforce. Student-athletes learn about the importance of teamwork, gain leadership skills and see firsthand the benefits of hard work, commitment and dedication. They also have to learn hard life lessons about winning and losing," Jenne said. "These are all skills that are important and transfer into the work world and life," she added. "It's always been important to me to be able to support athletic programs in the River District. 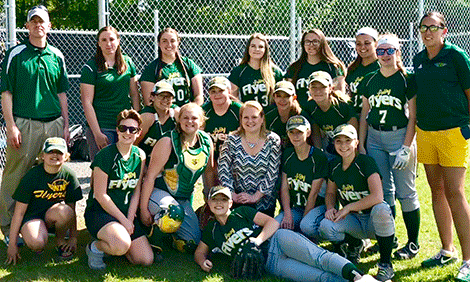 It was nice to see the upgrades that have been made to the girls' softball field," Assemblywoman Jenne noted. She pointed out she also had an opportunity to interact with the team’s five seniors at their senior night game and learn about their plans for the future. The funding for Norwood-Norfolk was part of $625,000 in supplemental state aid awarded to school districts in St. Lawrence and Jefferson counties, thanks to following an advocacy effort by Jenne’s advocacy. She has consistently fought for additional funding for high-needs schools. She obtained supplemental state aid for 10 school districts in the two-county region. "I advocated for supplemental aid to target North Country districts that face particular challenges due to the dynamics of their student populations. It's important to bring state tax dollars back to the North Country, and this is part of that effort," Jenne said.